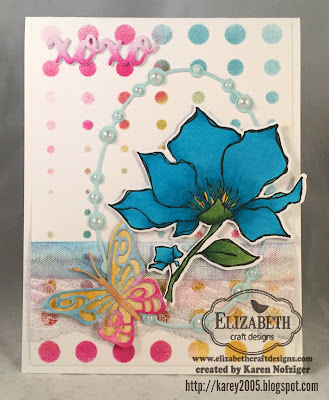 It's time for a new Elizabeth Craft Designs Challenge. These challenges are given to the designers, and they are SUCH fun. This month's challenge is called Fabulous Florals. 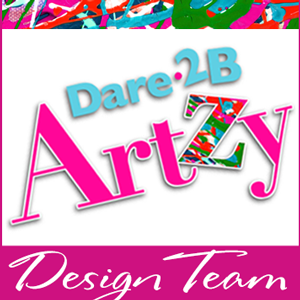 Be sure to stop by the design team blog post to see what gorgeous creations have been made by my design team sisters. For today's challenge Elizabeth Craft Designs are giving away a "Fabulous Flowers" prize pack to three winners. This give away will include: Joset Designs Pinwheel; Els van de Burgt Flower Cluster 1; Susan's Garden Tulip 2; A Way with Stencils -Butterfly Kaleidoscope Stencil; Krista Schneider Spring Blooms Stamp & Die set and ModaScrap Happy Flowers. The winners will be announced on Friday, March 24 on the Elizabeth Craft Designs blog. So much FuN with this card, and I really love how it turned out! The flower is colored with Copic markers: BG02, BG05, BG07, G40, G43, and G46 with touches of Y18. I cut it out with the Spring Blooms Coordinating Dies. For the stencil, I used distress inks in Picked Raspberry, Fossilized Amber and Broken China. The butterfly is also an Elizabeth Craft Designs die that I cut in soft finish white cardstock and then inked up with the same distress inks. The frame is a Beaded Oval Frames die cut of Soft Sky Soft Finish cardstock. The sentiment is from the Love Sentiments Dies. For this one, I just inked the bottom to get that fun ombre effect. To finish off the card, I added some pearls, lace and ribbon. Love the card. My favorite flower for spring is the daffodils, so many colors to chose from. Such a really pretty card love your touch of bling. My favourite spring flower is vase over flowing with Frechsia's and take in the most amazing scent....uuuummmmmmmmm!!!!! !